Panasonic’s Lumix DMC-GF1 might be the ideal camera for anyone who doesn’t want to make major compromises when they’re not using a single-lens reflex (SLR) camera. The DMC-GF1 is also good if you’d like to upgrade from your point-and-shoot, but don’t want to commit to the weight of an SLR. Measuring roughly 5.0-by-3.0-by-1.5, the DMC-GF1 is smaller than any SLR, but still offers removable lenses, giving you the benefits of an SLR-like lens selection in a camera that’s close to pocketable. 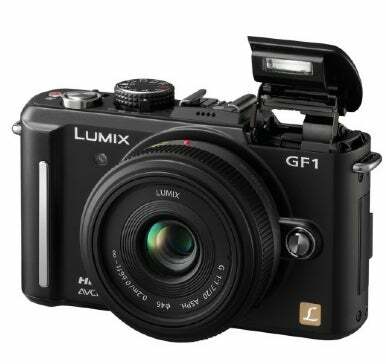 The DMC-GF1 is a Micro Four Thirds camera, meaning it conforms to a design specification defined by Panasonic, Olympus, and Leica. Micro Four Thirds cameras are built around larger sensors that yield better image quality and less noise than what you’ll find in a small point-and-shoot. Because they lack the mirrors and prisms required by an SLR, they can be built much smaller than a SLR while still maintaining the advantages provided by removable lenses. And because they all conform to a specification defined by a consortium of participating companies, you can easily interchange lenses from different Micro Four Thirds vendors. All of these features make the DMC-GF1 a very interesting camera. The DMC-GF1 is a well-made, sturdy, and very pretty camera. Basically a simple box with a little bit of molding on the front, it’s a compact design that is reminiscent of Leica-style rangefinder film cameras of old. Solidly made, the camera feels very good in the hand and is easy to hold. The top of the camera sports a hot shoe, mode dial, shutter button, and a few other controls, as well as a pop-up flash that closes flush with the top of the camera’s body. On the back, you’ll find more controls, as well as a big 3-inch LCD screen. Curiously absent from the camera is any kind of optical viewfinder. While this is not unusual for a point-and-shoot camera, the DMC-GF1 looks so much like a traditional rangefinder camera that one expects to see some kind of viewfinder window. Instead, you use Live View through the LCD to frame your pics, although Panasonic does offer an optional electronic eyepiece viewfinder that clips on to the hot shoe. While the DMC-GF1’s image sensor has a 4:3 aspect ratio, the LCD screen itself has a 3:2 aspect ratio, implying that Panasonic expects most users to switch the camera to 3:2 mode. (This is the same aspect ratio as 35mm film.) This is a very good move on Panasonic’s part, as I much prefer the slightly more rectangular 3:2 proportions to the boxier 4:3. The DMC-GF1 ships bundled with either a 14mm to 45mm f3.5 to f5.6 lens, or a 20mm f1.7 prime lens. Micro Four Thirds cameras have a multiplication factor of 2X, which means that these lenses have the 35mm film camera equivalent to 24mm to 90mm and 40mm, respectively. The lenses themselves are very small when compared to SLR lenses. This is because the DMC-GF1 does not require a big mirror in front of the lens to facilitate an SLR-style viewfinder. As such, Panasonic can get the back of the lens extremely close to the image sensor, which allows for smaller lens designs. The 20mm “pancake” lens, for example, is only 1-inch long. One of the things that make the DMC-GF1 feel like more than a normal point-and-shoot are the zoom and focus rings on the lenses. Rather than a lever for zooming in and out, the actual rings help to give the DMC-GF1 the feel of a much larger camera. Panasonic has done an excellent job with the DMC-GF1 interface. All essential shooting functions (mode, burst, ISO, white balance, exposure compensation, and exposure lock) are available from external buttons, and the menus for changing options are easy to use, making it possible to change settings very quickly. The DMC-GF1 provides all of the shooting modes that you’d expect: auto, program, shutter and aperture priority, full manual, and an assortment of shooting modes. In priority and manual modes, a single control wheel on the back of the camera gives you a simple way to change exposure parameters. In Program mode, the same wheel doubles as a program shift control, and an exposure compensation control. Two different menus are provided. The Quick Menu gives you a way to quickly change secondary shooting parameters (shooting format, JPEG processing profiles, aspect ratio, metering mode, and more) while the regular menu holds less often used utility features such as card formatting and color space selection. This is a smart arrangement that makes for menus that are easy to navigate and features that are fairly easy to find. The DMC-GF1 also includes two custom modes on its mode dial. With these, you can easily create custom configurations that can be activated by simply changing the mode dial to C1 or C2. For example, you could set up one of these modes to have a particular aspect ratio, white balance, image format, and priority setting, then simply change to that mode to activate all of those settings. One of the most clever interface innovations on the camera is the drive mode control that sits around the Mode dial. This simple rotating switch allows you to switch from single shot mode to burst, self-timer, or a burst with bracketing mode. This last option activates both auto bracketing and drive mode. Since you usually shoot bracketed sets using burst mode, this control provides a very nice interface economy. If you’re coming from an SLR, you’ll find all of the controls and features that you would expect to find on a sophisticated camera. If you’re moving up from a point-and-shoot, you’ll find that the DMC-GF1 provides you with lots of room to explore and grow. The DMC-GF1 provides a very satisfying shooting experience. Responsive and easy to work with, the camera has a sound and feel that is very similar to a 35mm rangefinder camera. The camera’s autofocus is very speedy and capable, and as you’d expect in a camera at this price point, the DMC-GF1 does not exhibit any shutter lag. Autofocus options include 23-point autofocus, a single center-point focus, face detection, and focus tracking, for shooting moving objects. The biggest adjustment for SLR shooters is the lack of optical viewfinder, and this is my biggest complaint with the camera. While the LCD screen is big, bright, and beautiful, it’s still very difficult to use in bright light, and I prefer to have a viewfinder that I can put my eye up to, to block out the rest of the world while I’m shooting. It’s difficult to shoot quickly with the LCD viewfinder, so this isn’t the best tool for sports or nature shooting. We did not have a chance to review Panasonic’s clip-on electronic viewfinder, but I’ve never liked electronic viewfinders, and would prefer a clip-on optical like the one that Olympus provides for their micro four thirds camera, the EP-1. While the DMC-GF1 will work with any Micro Four Thirds lens (and many other lens types, with an appropriate adapter) continuous autofocus will not work with all lenses, such as Panasonic’s 20mm lens and many legacy Olympus-made lenses. Continuous autofocus automatically tracks a moving subject and keeps it in focus. Because you’ll rarely need this feature when working with a lens as wide as 20mm, this is not a terrible problem. Manual focus is surprisingly effective with the DMC-GF1, thanks to the automatic enlargement that the camera shows on its LCD. When switched to manual focus, the camera blows up the image on the LCD viewfinder as soon as you turn the focus ring. Because the screen is so good, manual focus is actually easy. The camera’s depth of field simulation feature does a very good job of showing you what the depth of field will be in your final image. With a maximum aperture of 1.7, the 20mm lens is capable of extremely shallow depth of field, so the ability to accurately preview your focus and depth of field is very handy. This is a great feature and it shows that Panasonic is thinking about what serious photographers need in a camera. While the DMC-GF1 lacks sensor stabilization, many of its zoom lenses are stabilized with Panasonic’s Mega OIS stabilization. On longer lenses, this is a welcome addition, and because the stabilization is lens-based, you can see the effects of it in the viewfinder, making for easier framing. The DMC-GF1’s pop-up flash is good enough for simple fill, and far enough from the lens that you won’t have trouble with red-eye. Image quality is very good, thanks both to the camera’s sensor and processing prowess, and the extremely high-quality lenses that Panasonic is bundling. That said, if you’re used to shooting in low light with an SLR that has very good high ISO performance, then the DMC-GF1 will be a disappointment. In a low-lit café, I found images shot at 1600 unusably noisy. For those who are looking for video capability, note that the camera provides 720p video recording with mono sound. When combined with a lens like the 20mm f1.7, you can make creative decisions that you can’t get on a point-and-shoot still camera or even most video cameras. The Lumix DMC-GF1 is a very interesting little camera. It’s small size and traditional design make it ideal for simple street shooting and other casual shooting endeavors. While the LCD viewfinder makes it difficult to shoot in bright light, the lens quality will still be tempting to shooters of any kind of subject matter. If you’ve been thinking of buying a larger point-and-shoot type camera (something like the Canon PowerShot G11) then you’ll definitely want to take a look at the DMC-GF1. It’s more expensive, but the better image quality and option to change lenses give it a definite advantage over an advanced point-and-shoot. If you’re an SLR shooter, the DMC-GF1 provides a nice alternative to a bulky SLR rig. For times when you don’t want to take your full kit, the DMC-GF1 might be an ideal alternative. Bear in mind, though, that it still might not fit in a pocket, and if you’re heading somewhere dark, you might be better off with your SLR. All in all, the DMC-GF1 is a very compelling photo tool, and one that any serious shooter will want to consider.